After taking control of much of the country in December and January, rebels in the Central African Republic have been given a place in a new unity government that was announced last Sunday. The formation of this government will officially end the country's period of division between the old administration and the "Séléka" rebel coalition. However, it remains to be seen whether the Central African Republic will truly be reunited in terms of the facts on the ground. Insecurity and chaos has continued at reduced levels since the ceasefire of January 11, with one band of rebels even attacking two more towns during the interim (see updated map at right). 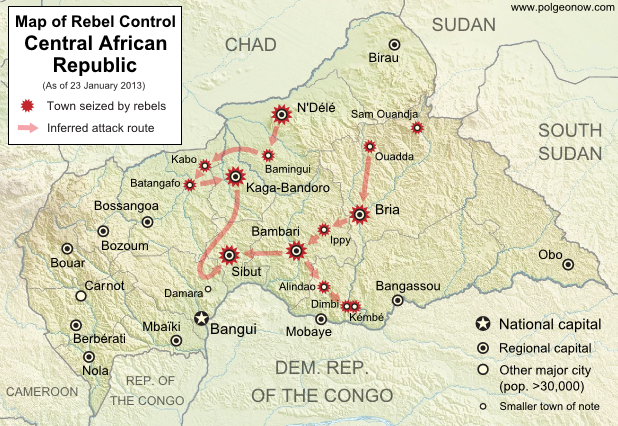 For the full story of Séléka's lighting-fast campaign to control the country, see our previous article Central African Republic: Map of Rebel Control.